The Runner plays Prey and runs on a remote server protected by Turing. If the Runner then uses Inversificator to break all subroutines on Turing and swaps it with a piece of ice protecting R&D, how many cards must the Runner trash in order to trash the Turing? After the Runner uses Inversificator to swap the Turing with another piece of ice, the Runner is no longer passing the Turing. Prey's trigger condition is no longer valid and the ability fails to trigger. 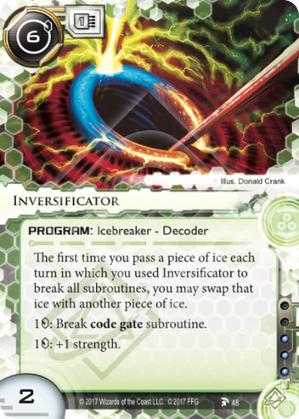 Can the Runner use Inversificator to swap the passed piece of ice with an ice in Archives? No. Unless specified otherwise, only installed cards can be chosen by effects. Find a server with a Barrier on the outside, use Surfer to go all the way in, then use Inversificator to put it back on the outside of the server ready for next time! Requires Kit/Paintbrush/Tinkering/Egret, and with the latter two you can do it multiple times in the same turn. As a bonus, you can use this to PUT that weak barrier ICE in position to start with. This is especially fun with Egret because you can just slap that on any weak ICE, put it in front of the server you want into, and go to town. Stuff things you don't like on servers you don't care about so you don't have to think about them any more. Swap unrezzed ICE onto the server you're hitting, then Blackmail your way past it either now or later. Most of this works without Kit, of course, but it's so much more universally applicable with her and hard to justify the cost without being able to eke out some serious savings in the next few turns after installing. Probably consigned to the jank bin anyway. Still a good fun way to get into servers in style, though.